This is only the second book of Jio’s I’ve read, but it’s another home run. 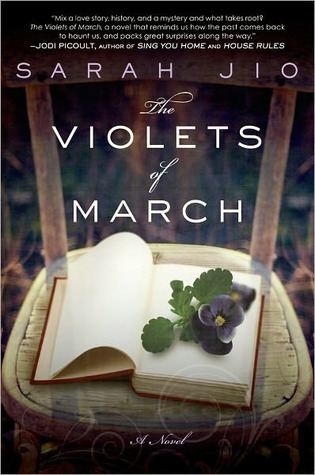 In The Violets of March, Emily is going through a bit of a rough patch. She’s getting a divorce and hasn’t been able to write a decent word since the publication of her first novel 8 years prior. At the suggestion of her best friend Annabelle, she travels to Bainbridge Island in Washington. It’s always had a special palace in her heart and Annabella thinks its exactly what she needs. Once there, Emily finds a small notebook with a fascinating story unfolding on its pages. The story of Ester and the tragedy that befalls her is what draws Emily in and starts the healing process. Every character in this book is wonderful. Aunt Bee is just eclectic enough, Jack is the sweetheart, and even the characters in the story within the story are well-written. They are what make this novel so engaging. They are what make the words on the page come to life and wrap you up in the beauty of the island. There is a romance in this novel, but instead of distracting from the character building, it only aids Emily in the search for herself. The relationships in the novel only add to the fantastic characterizations. Something else I love about Jio’s writing is how easily she can take me into the setting of the story. There is something about her writing that just draws you in so well that when she describes the water, you can see it, smell it, hear it, taste it, and feel it. You are immediately pulled in and even when you stop reading, everything lingers. TheViolets of March is a superb novel about family secrets and finding out who you really are. It pulls you right onto Bainbridge Island and wraps you up in the sea breeze. I is another fantastic novel by Jio and only serves to prove that Jo is an author you must read. This entry was posted in Contemporary, The Must Reads and tagged Contemporary, History, Must-Reads, Mystery/Thriller, Sarah Jio.